The German company Grimme, Natalis and Co. of Braunschweig obtained the German patent rights to the Odhner pinwheel calculator in 1982, and produced similar machines under the Brunsviga name. 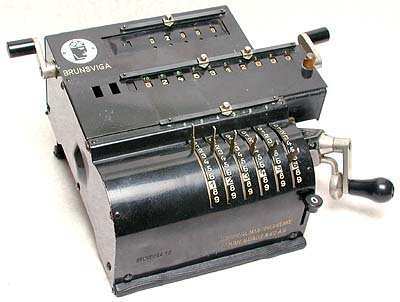 The company improved and developed the Brunsviga which became one of the most successful mechanical calculators and was produced up to the early 1970s. The company merged with Olympia in 1959 but Brunsviga name continued to be used. Hand-held electronic calculators under the Brunsviga name are known, maybe badged for whoever owned the Brunsviga name at the time. This is a compact stepped-drum machine, and is a featured calculator. 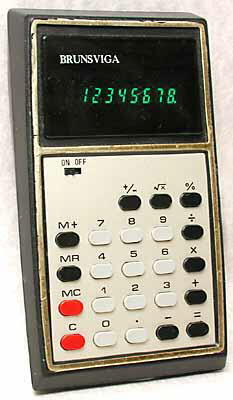 Hand-held calculator from the mid-1970s with green vacuum fluorescent display, badged with the Brunsviga name. For further photographs of Brunsviga hand-held calculators see the Calculator Photo Library on this site.